Received June 6, 2018; Accepted August 22, 2018.; Published online October 10, 2018. During the cortical development, cells in the brain acquire somatic mutations that can be implicated in various neurodevelopmental disorders. There is increasing evidence that brain somatic mutations lead to sporadic form of epileptic disorders with previously unknown etiology. In particular, malformation of cortical developments (MCD), ganglioglioma (GG) associated with intractable epilepsy and non-lesional focal epilepsy (NLFE) are known to be attributable to brain somatic mutations in mTOR pathway genes and others. In order to identify such somatic mutations presenting as low-level in epileptic brain tissues, the mutated cells should be enriched and sequenced with high-depth coverage. Nevertheless, there are a lot of technical limitations to accurately detect low-level of somatic mutations. Also, it is important to validate whether identified somatic mutations are truly causative for epileptic seizures or not. Furthermore, it will be necessary to understand the molecular mechanism of how brain somatic mutations disturb neuronal circuitry since epilepsy is a typical example of neural network disorder. In this review, we overview current genetic techniques and experimental tools in neuroscience that can address the existence and significance of brain somatic mutations in epileptic disorders as well as their effect on neuronal circuitry. Somatic mutations, which arise in somatic cells and are not inherited to offspring, can occur during cell division (Bae et al., 2018). Although these somatic mutations are well known as the major causative genes for cancer (Lee et al., 2012; Poduri et al., 2012; Shirley et al., 2013), their existence in the brain and their pathological role in neurodevelopmental disorders have recently begun to be discovered (Lim et al., 2017). During the cortical development in the brain, neuronal cells undergo 105 divisions per minute (Insel, 2014). About five single nucleotide variations per day per neuronal progenitor accumulate during neurogenesis (Bae et al., 2018; Lodato et al., 2018). Unlike other organs, the human brain consists of ~100 billions of neurons connected to each other through synapses and its unique function depends on where it is located in the brain, so that somatic variations affecting neuronal function in the focal area can alter the function of surrounding neurons as well as the entire brain (Bargmann and Marder, 2013; DeFelipe, 2010). Epilepsy, a neurological disorder characterized by recurrent seizures, affects more than 50 million people worldwide (Singh and Trevick, 2016). Two-thirds of epilepsy are thought to be attributable to the genetic etiology (Hildebrand et al., 2013; Myers and Mefford, 2015). There are rare epileptic disorders with Mendelian inheritance, but most of epileptic disorders occur sporadically without any family history, suggesting de novo genetic variations including germline and somatic mutations may contribute to these conditions (Briellmann et al., 2001). In a recent genetic study of 264 epileptic encephalopathy trio populations, de novo germline variation was found in only 8% of patients (Allen et al., 2013). Evidence that epilepsies negative for germline mutations can be caused by somatic mutations has begun to be revealed (Lee et al., 2012; Lim et al., 2015; 2017; Shirley et al., 2013). Since the cause of epilepsy is directly related to the choice of treatment, identifying genetic etiologies in patients is important in therapy. To identify somatic mutations in epileptic brains, there are several technical issues to be considered. Since brain somatic mutations are an organ-specific genetic variation, genomic DNA in the affected brain tissues should be analyzed compared to that in the unaffected tissues (e.g. blood or saliva) from the same patient. Cells carrying somatic mutations do not appear as the tumor mass with high-level of mutational burden, so a high depth of sequencing in the bulk tissue or single cell sequencing is necessary to detect a small fraction of cells with somatic mutations. Advanced sequencing technology and analysis tools to find out causative mutations or genes in epilepsy patients are getting the spotlight in the epileptology and allow to achieve the precision medicine in epilepsy by providing a new genetic biomarker, an accurate genetic diagnosis, and an etiology-specific treatment. In this review, we describe brain somatic mutations causing epilepsy found so far and a methodological aspect to identify somatic mutations in epileptic brain tissues. In addition, we discuss a modeling strategy to capture the neuronal network altered by somatic mutations and studies how somatic variations lead to epileptogenic neural network circuits. We hope that this review provides the consideration of new aspect of epilepsy genetics and defective neural network related to brain somatic mutations. To date, several study groups have reported brain somatic mutations underlying intractable epilepsy using high-depth coverage sequencing in matched affected brain and unaffected non-brain samples from patients. Brain somatic mutations found in epileptic disorders are summarized in Table 1. Hemimegalencephaly (HME) is a rare and sporadic neurodevelopmental disorder presenting enlargement of one side of cerebral hemisphere and intractable epilepsy. Brain somatic mutations in PI3CA, AKT3, and MTOR are strongly associated with HME. For example, a study showed 30% of HME patients (6 of 20) have brain somatic mutations in PI3CA, AKT, or MTOR. Because of the relatively large area affected by HME, the variant allele frequency of identified somatic mutations were observed between 10–40% across different brain regions (Lee et al., 2012). Focal cortical dysplasia (FCD) is a major cause of drug-resistant epilepsy in children. In particular, FCD type II (FCDII) is characterized by migration defects in cortical neurons and neuronal dysplasia (Barkovich et al., 1996). It had been a long-term hypothesis that somatic mutations might be implicated in FCD, because this condition shows sporadic occurrence without familial history, and no abnormal pathologic features are observed in other parts of the body (Crino, 2009). Indeed, deep sequencing in matched brain and peripheral tissues has revealed that somatic mutation in MTOR found in an only small group of cells accounted for ~16% of FCDII patients (Lim et al., 2015). Their mutational burden ranged from 1 to 10% of variant allele frequency. Brain somatic mutations in TSC1 or TSC2 with 1–2% of mutated allele frequency were further found in ~13% of FCDII patients negative for somatic mutations in MTOR (Lim et al., 2017). As a result, brain somatic mutations activating mTOR kinase accounted for ~30% of FCDII patients. FCD can also occur in a two-hit fashion that somatic mutations are added on pre-existing germline mutations in the same gene. It was recently reported that two-hit on domain-containing protein 5 (DEPDC5), which is subunit of the GTPase-activating proteins in Rags 1 (GATOR1) complex that modulates of MTOR, led to FCD (Ribierre et al., 2018). Somatic mutations have been also discovered in epilepsy-related neurocutaneous syndrome. For example, p.Arg183Gln amino acid substitution in guanine nucleotide binding protein q polypeptide (Gαq) was reported to cause Sturge–Weber syndrome characterized by a port-wine nevus in the skin, epileptic seizures, stroke, and intellectual disability (Shirley et al., 2013). Targeted deep sequencing study in a large cohort of patients with abnormal cortical development identified somatic mutations in genes regulating the development of neuronal cells. For example, patients with double cortex syndrome (DCS), paraventricular nodular hyperplasia (PVNH), and pachygyria (PAC) with epileptic seizures were found to have somatic mutations in genes such as DCX (3 of 30), LIS1 (3 of 30), FLNA (1 of 61), and TUBB2B (1 of 47) (Jamuar et al., 2014). Also, oncogenic somatic mutations found in epilepsy associated brain tumors may contribute to epileptogenesis. Somatic mutations in MTOR found in FCD and HME patients with intractable epilepsy were recurrently reported as tumor driving mutations in various cancers (Grabiner et al., 2014; Xu et al., 2016). In line with this, the BRAF V600E somatic mutation, which is thought to function as a simply tumorigenic gene in glioneuronal tumor, is strongly associated with epilepsy associated brain tumors in children (Blumcke et al., 2016). This mutation was found in >50% of patients with ganglioglioma (GG) presenting intractable epilepsy (Schindler et al., 2011). Recently, BRAF V600E mutations is experimentally validated to contribute to intrinsic epileptogenesis in pediatric brain tumors (Koh et al., 2018). In non-lesional focal epilepsy (NLFE), significant radiologic or pathologic abnormalities are not observed in patients with this condition. Recently, brain somatic mutations in SLC35A2 gene associated with glycosylation defects and X-linked epileptic encephalopathies are found in 17% of NFLE patients (Winawer et al., 2018). Although the mechanism of how SLC35A2 mutations cause epilepsy remain unknown, that aberrant glycation of brain cells in the focal area may play an important role in the development of epileptic disorders. The type of cells that carry somatic mutations and cause the epileptic seizure is not always necessary to be a neuronal cell. The somatic mutation in brain endothelial cells may play an important role in inducing the seizure. Brain arteriovenous malformation (BAVM) is characterized by abnormal blood vasculature structure connecting arteries and veins in the brain (Crawford et al., 1986). This condition is one of the causes of intractable epilepsy. In a recent whole exome sequencing study, KRAS somatic mutations in endothelial cells were identified in 15% of (4 of 26) BAVM patients (Nikolaev et al., 2018). This suggests that neuronal cells, as well as other types of cells with somatic mutations in the brain, can contribute to epileptogenesis. Patients with drug-resistant epilepsy often undergo surgical resection of the epileptogenic focus in the brain to control seizures (Fig. 1A) (Perry and Duchowny, 2013). However, some patients still continue to show epileptic seizures even after proper surgical treatment (Tezer et al., 2008). Also, most antiepileptic drugs do not target the underlying molecular genetic cause (Loscher et al., 2013). Thus, in order to develop the better therapeutic in intractable focal epilepsy, it is necessary to identify the molecular genetic etiology in epileptic disorders. Unlike the common genetic tests in blood or saliva used to identify germline mutations in familial diseases, there are important consideration for examining brain somatic mutations in epileptic disorders. In the case of brain somatic mutations in epilepsy, it is difficult to accurately find a small fraction of variation. In cancer, mutated cells proliferate and form a clonal mass, showing a high rate of mutated allele frequency. In non-cancerous condition, neurons have a limitation of cell division. Therefore, in order to find low-level of brain somatic mutation causing epilepsy, it is necessary to enrich the mutated cells or to perform sequencing with a high coverage depth by comparing affected brain tissues to unaffected other tissues from the same patient (Fig. 1B and 1C) (Lee, 2016). Since there are many kinds of cells in the brain, cells of interest can be isolated using several methods such as fluorescence activated cell sorting (Evrony et al., 2012) or laser capture microdissection (Lim et al., 2015; 2017). For example, in a recent FCD study, only ~20 dysmorphic neurons were enriched by laser capture method and the single nucleotide variation with 5% VAF found in each patient could be reaffirmed (Lim et al., 2015). It should be noted that some sequencing platforms can produce sequencing errors up to 13% (Quail et al., 2012), which hamper to detect the true somatic mutations with low VAF. In the library preparation phase, errors are caused by oxidative DNA damage such as G > T or C > A mutations originating from 8-oxoguanine (Chen et al., 2017). For somatic mutations with less than 1% of VAF, conventional next-generation sequencing method is inaccurate to detection them (Stead et al., 2013; Xu et al., 2014). Unexpected errors are generated and amplified in the process of the library preparation, which seems to produce false positive variants (Schirmer et al., 2015). To solve this problem, an algorithm called ‘RePlow’ using platform independent and library level replicates has been recently developed to more accurately detect the low VAF and increase the sensitivity and specificity (Kim et al., 2017). It is based on an algorithm, which basic principle is to probabilistically eliminate common errors occurring between two independent library-level replicates, facilitating remarkable improved precision of detecting low VAF. Many mutation callers including MuTect, Strelka, VarScan2, and SomaticSniper are optimized for the analysis of somatic mutations in cancer. In these methods, if mutation burdens are less than 8% of VAF, the sensitivity of mutation detection begins to decrease significantly (Xu et al., 2014). Therefore, it should be careful to analyze and interpret brain somatic mutations since there could be various sequencing errors arising from the various steps of sequencing process. Although evidence of somatic mutations leading to epileptic disorders is increasing (Table 1), little is known about how these somatic mutations make the epileptic neural network (McConnell et al., 2017). This is important for understanding the exact molecular mechanism of intractable epilepsy caused by somatic mutations and providing a new targeted therapy accordingly. To confirm the causality of identified mutations, it is necessary to test whether brain somatic mutations cause epileptic phenotype in the model organism and disturb neural network (Chin et al., 2011). Epilepsy is not simply a cytologic problem, but rather a disorder of the neuronal network (Bassett & Sporns, 2017). In the past, a lot of studies in epileptology have focused on electrical or chemoconvulsants induced seizure model using pentylene-tetrazol (PTZ), kainic acid (KA) or electroshock focal application (Löscher, 2011). However, they are inconsistent with the condition of the patient. Furthermore, in terms of the pathophysiology of focal epilepsy, epilepsy models with brain somatic mutations are totally distinct from previous epilepsy models. In the epilepsy models with brain somatic mutations, a small number of cells with somatic mutations in the affected brain is sufficient to induce epileptic seizures via unusual communication of surrounding cells and synapses, thereby destroying the whole cerebral balance (Lee, 2016; McConnell et al., 2017). In line with this, brain somatic mutations in epileptic disorders have been recently modeled to elucidate their causality and to figure out novel therapeutic targets in vivo (Lim et al., 2015; McConnell et al., 2017). In utero electroporation in the embryonic mouse brain is one of the methods to introduce somatic mutations into a part of brain region (Fig. 2A) (Lim et al., 2015; 2017). Regarding the gain-of-function mutations like somatic activating mutations in MTOR, overexpression of the mutated gene in the electroporated cell was sufficient to induce spontaneous behavioral seizure (Lim et al., 2015). Also, such mutations can be modeled in vivo by directly editing mouse genomic DNA via the CRISPR-Cas9 method (Lim et al., 2017; Shinmyo and Kawasaki, 2017) or the base editor technique (Gaudelli et al., 2017), which is closer to the patient’s mutation. For example, somatic knock out of the TSC1 or TSC2, similar to the loss-of-function mutations found in FCD patients, was reproduced in the mouse brain through in utero electroporation of Cas9 and Tsc1 or Tsc2 sgRNA expressing vector. These model mouse with brain somatic mutations in Tsc1 or Tsc2 were able to exhibit seizures as well as cortical abnormalities (Lim et al., 2017). The mutated gene is directly introduced into the focal region of brain by viral injection, thereby mimicking a focal somatic mutation (Fig. 2B). Such mouse models with brain somatic mutations exhibit a small proportion of mutated cells similar to those in patient’s tissue and a prominent epileptic seizure on the EEG, so that it can be determined whether the mutation found in the patient is actually an epileptogenic and disease-causing variant (Fig. 2C and 2D). These model mice also help to test novel antiepileptic drugs directly targeting somatic mutations. For example, our group identified somatic activating mutations in MTOR in brain tissues from FCD patients (Lim et al., 2015). 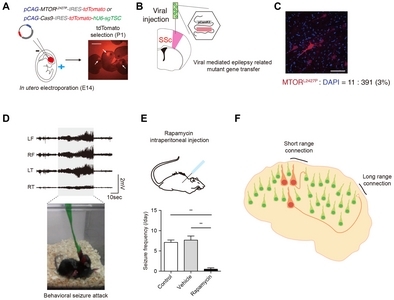 After generating the corresponding animal model via in utero electroporation of MTOR mutant expressing vectors, we found that these mouse models presented the epileptic seizures and were tested with MTOR inhibitor as new therapy for intractable epilepsy in FCD patients (Fig. 2E). Epilepsy mice with brain somatic mutations can be a useful model to reflect the actual pathogenesis of patients and study the change of neural network underlying intractable focal epilepsy. Previous electrical or chemoconvulsants induced seizure models are not suitable for pinpointing the origin-of-cell for epilepsy at the molecular genetic level as well as the starter cells leading to epileptogenic neural network. However, in epilepsy mice with brain somatic mutations, it would be possible to confine the origin-of-cell with somatic mutations inducing focal epilepsy and examine short- and long-range networks disturbed by mutation-carrying cells using the multi-electrode array (Ferrea et al., 2012), multi-unit recording (Pinault, 2003), or genetically encoded Ca2+ indicator (GECI) with high-resolution two-photon microscope (Tian et al., 2005) (Fig. 2F). Recently, a lot of experimental interfaces that record or manipulate neural activity in vivo have been developed. Optogenetic manipulation uses light to control neurons genetically modified to express light-sensitive ion channels (Deisseroth, 2011). The expression of inhibitory channel opsins (halorhodopsin) in excitatory neuron or excitatory channelrhodopsin in GABA neurons could stop seizure in kainic acid (KA) injected temporal lobe epilepsy model mouse (Krook-Magnuson et al., 2013). Likewise, designer receptor exclusively activated by a designer drug (DREADD) is another tool of neuronal modulation using chemicals (Katzel et al., 2016). If the methods described above are properly applied, it may be possible to specify the ictal focus of epileptic seizures and aberrant neural network caused by brain somatic mutations. In this review, we described our current understanding of brain somatic mutations leading to epileptic disorders, genetic consideration for examining somatic mutation in brain tissues from intractable epilepsy patients, and the possible methods to explain the change of brain network induced by brain somatic mutations. As we described above, accumulating evidence shows brain somatic mutation is a major cause of epileptic disorders. Identifying accurate somatic mutations in patients with refractory epilepsy, verifying their causality, and providing new the treatment will help to understand the molecular genetic basis and expand the therapeutic choices of intractable epilepsy. However, several fundamental questions remain to be answered in this field. For example, what is the exact mutation burden necessary for making the epileptogenic network? Does the timing or brain region of somatic mutations affect the phenotype of epileptic seizures? What is the molecular genetic mechanism that a small fraction of mutated neurons changes the entire brain network and function? The answers to these questions will provide a new insight into how the somatic mutation contributes to the network of epilepsy and its comorbid neuropsychiatric disorder (Insel, 2014; Lee, 2016; McConnell et al., 2017). Fig. 1. (A) Post operation MRI image of epilepsy surgery and specimen collection process. (B) Enrichment of mutation carrying cells for sequencing ready samples. Note that percentage of cells with mutations is much higher than before enrichment. (C) Example of read stacks implying necessity of high coverage depth genome wide sequencing to emphasize epilepsy causing mutation without false negative. Fig. 2. (A) Schematic process of in utero electroporation of epilepsy causing genes. Scale bar = 5mm. (B) Viral injection of epilepsy causing mutated gene in focal brain region. SSc, somatosensory cortex. (C) Immunofluorescence image of electroporated region of brain. Scale bar = 50μm. Note that the proportion of mutant cells is only about 3%, despite being the brightest region of the cortex. (D) Electroencephalography of mouse model carrying brain somatic mutation during seizure attack. (E) Rapamycin, MTOR inhibitor, injection into intraperitoneal space of brain somatic mutated mouse. The frequency of seizure in Rapamycin treated group (n = 6 mice) is significantly decreased compared to control (n = 9 mice) or vehicle injected group (n = 6 mice). One-way ANOVA with Dunn’s multiple comparison test. **P < 0.01. (E) Short- and long-range network affected by somatic mutations. Somatic mutations related to epileptic disorder. Abbreviation: TS, targeted sequencing; WES, whole exome sequencing; SWS, Sturge Weber syndrome; FCD, focal cortical dysplasia; HME, hemimegalencephaly; GG, ganglioglioma; NLFE, nonlesional focal epilepsy; BAVM, brain arteriovenous malformation; DCS, double cortex syndrome (SBH, subcortical band heterotopia); PVNH, paraventricular nodular hyperplasia; PAC, pachygyria. Alcantara, D., Timms, A.E., Gripp, K., Baker, L., Park, K., Collins, S., Cheng, C., Stewart, F., Mehta, S.G., and Saggar, A. (2017). Mutations of AKT3 are associated with a wide spectrum of developmental disorders including extreme megalencephaly. Brain. 140, 2610-2622. Allen, A.S., Berkovic, S.F., Cossette, P., Delanty, N., Dlugos, D., Eichler, E.E., Epstein, M.P., Glauser, T., Goldstein, D.B., and Han, Y. (2013). De novo mutations in epileptic encephalopathies. Nature. 501, 217-221. Bae, T., Tomasini, L., Mariani, J., Zhou, B., Roychowdhury, T., Franjic, D., Pletikos, M., Pattni, R., Chen, B.J., and Venturini, E. (2018). Different mutational rates and mechanisms in human cells at pregastrulation and neurogenesis. Science. 359, 550-555. Bargmann, C.I., and Marder, E. (2013). From the connectome to brain function. Nat Methods. 10, 483-490. Barkovich, A.J., Kuzniecky, R.I., Dobyns, W.B., Jackson, G.D., Becker, L.E., and Evrard, P. (1996). A classification scheme for malformations of cortical development. Neuropediatrics. 27, 59-63. Bassett, D.S., and Sporns, O. (2017). Network neuroscience. Nat Neurosci. 20, 353-364. Blumcke, I., Aronica, E., Becker, A., Capper, D., Coras, R., Honavar, M., Jacques, T.S., Kobow, K., Miyata, H., and Mühlebner, A. (2016). Low-grade epilepsy-associated neuroepithelial tumours - the 2016 WHO classification. Nat Rev Neurol. 12, 732-740. Briellmann, R.S., Torn-Broers, Y., and Berkovic, S.F. (2001). Idiopathic generalized epilepsies: do sporadic and familial cases differ?. Epilepsia. 42, 1399-1402. Chen, L., Liu, P., Evans, T.C., and Ettwiller, L.M. (2017). DNA damage is a pervasive cause of sequencing errors, directly confounding variant identification. Science. 355, 752-756. Chin, L., Andersen, J.N., and Futreal, P.A. (2011). Cancer genomics: from discovery science to personalized medicine. Nat Med. 17, 297-303. Crawford, P.M., West, C.R., Chadwick, D.W., and Shaw, M.D. (1986). Arteriovenous malformations of the brain: natural history in unoperated patients. J Neurol Neurosurg Psychiatry. 49, 1-10. Crino, P.B. (2009). Focal brain malformations: seizures, signaling, sequencing. Epilepsia. 50, 3-8. D’Gama, A.M., Geng, Y., Couto, J.A., Martin, B., Boyle, E.A., LaCoursiere, C.M., Hossain, A., Hatem, N.E., Barry, B.J., and Kwiatkowski, D.J. (2015). Mammalian target of rapamycin pathway mutations cause hemimegalencephaly and focal cortical dysplasia. Ann Neurol. 77, 720-725. D’Gama, A.M., Woodworth, M.B., Hossain, A.A., Bizzotto, S., Hatem, N.E., LaCoursiere, C.M., Najm, I., Ying, Z., Yang, E., and Barkovich, A.J. (2017). Somatic mutations activating the mTOR pathway in dorsal telencephalic progenitors cause a continuum of cortical dysplasias. Cell Rep. 21, 3754-3766. DeFelipe, J. (2010). From the connectome to the synaptome: an epic love story. Science. 330, 1198-1201. Deisseroth, K. (2011). Optogenetics. Nat Methods. 8, 26-29. Evrony, G.D., Cai, X., Lee, E., Hills, L.B., Elhosary, P.C., Lehmann, H.S., Parker, J.J., Atabay, K.D., Gilmore, E.C., and Poduri, A. (2012). Single-neuron sequencing analysis of L1 retrotransposition and somatic mutation in the human brain. Cell. 151, 483-496. Ferrea, E., Maccione, A., Medrihan, L., Nieus, T., Ghezzi, D., Baldelli, P., Benfenati, F., and Berdondini, L. (2012). Large-scale, high-resolution electrophysiological imaging of field potentials in brain slices with microelectronic multielectrode arrays. Front Neural Circuits. 6, 80. Gaudelli, N.M., Komor, A.C., Rees, H.A., Packer, M.S., Badran, A.H., Bryson, D.I., and Liu, D.R. (2017). Programmable base editing of A*T to G*C in genomic DNA without DNA cleavage. Nature. 551, 464-471. Grabiner, B.C., Nardi, V., Birsoy, K., Possemato, R., Shen, K., Sinha, S., Jordan, A., Beck, A.H., and Sabatini, D.M. (2014). A diverse array of cancer-associated MTOR mutations are hyperactivating and can predict rapamycin sensitivity. Cancer Discov. 4, 554-563. Hildebrand, M.S., Dahl, H.H., Damiano, J.A., Smith, R.J., Scheffer, I.E., and Berkovic, S.F. (2013). Recent advances in the molecular genetics of epilepsy. J Med Genet. 50, 271-279. Insel, T.R. (2014). Brain somatic mutations: the dark matter of psychiatric genetics?. Mol Psychiatry. 19, 156-158. Jamuar, S.S., Lam, A.T., Kircher, M., D’Gama, A.M., Wang, J., Barry, B.J., Zhang, X., Hill, R.S., Partlow, J.N., and Rozzo, A. (2014). Somatic mutations in cerebral cortical malformations. N Engl J Med. 371, 733-743. Jansen, L.A., Mirzaa, G.M., Ishak, G.E., O’Roak, B.J., Hiatt, J.B., Roden, W.H., Gunter, S.A., Christian, S.L., Collins, S., and Adams, C. (2015). PI3K/AKT pathway mutations cause a spectrum of brain malformations from megalencephaly to focal cortical dysplasia. Brain. 138, 1613-1628. Katzel, D., Nicholson, E., Schorge, S., Walker, M.C., and Kullmann, D.M. (2014). Chemical-genetic attenuation of focal neocortical seizures. Nat Commun. 5, 3847. Kim, J., Kim, D., Lim, J.S., Maeng, J.H., Son, H., Kang, H.-C., Nam, H., Lee, J.H., and Kim, S. (2017). Accurate detection of low-level somatic mutations with technical replication for next-generation sequencing. bioRxiv. Koh, H.Y., Kim, S.H., Jang, J., Kim, H., Han, S., Lim, J.S., Son, G., Choi, J., Park, B.O., and Do Heo, W. (2018). BRAF somatic mutation contributes to intrinsic epileptogenicity in pediatric brain tumors. Nat Med. Krook-Magnuson, E., Armstrong, C., Oijala, M., and Soltesz, I. (2013). On-demand optogenetic control of spontaneous seizures in temporal lobe epilepsy. Nat Commun. 4, 1376. Lee, J.H. (2016). Somatic mutations in disorders with disrupted brain connectivity. Exp Mol Med. 48, e239. Lee, J.H., Huynh, M., Silhavy, J.L., Kim, S., Dixon-Salazar, T., Heiberg, A., Scott, E., Bafna, V., Hill, K.J., and Collazo, A. (2012). De novo somatic mutations in components of the PI3K-AKT3-mTOR pathway cause hemimegalencephaly. Nat Genet. 44, 941-945. Leventer, R.J., Scerri, T., Marsh, A.P., Pope, K., Gillies, G., Maixner, W., MacGregor, D., Harvey, A.S., Delatycki, M.B., and Amor, D.J. (2015). Hemispheric cortical dysplasia secondary to a mosaic somatic mutation in MTOR. Neurology. 84, 2029-2032. Lim, E.T., Uddin, M., De Rubeis, S., Chan, Y., Kamumbu, A.S., Zhang, X., D’Gama, A.M., Kim, S.N., Hill, R.S., and Goldberg, A.P. (2017). Rates, distribution and implications of postzygotic mosaic mutations in autism spectrum disorder. Nat Neurosci. 20, 1217-1224. Lim, J.S., Gopalappa, R., Kim, S.H., Ramakrishna, S., Lee, M., Kim, W.I., Kim, J., Park, S.M., Lee, J., Oh, J.H., and Kim, H.D. (2017). Somatic Mutations in TSC1 and TSC2 Cause Focal Cortical Dysplasia. Am J Hum Genet. 100, 454-472. Lim, J.S., Kim, W.I., Kang, H.C., Kim, S.H., Park, A.H., Park, E.K., Cho, Y.W., Kim, S., Kim, H.M., and Kim, J.A. (2015). Brain somatic mutations in MTOR cause focal cortical dysplasia type II leading to intractable epilepsy. Nat Med. 21, 395-400. Lodato, M.A., Rodin, R.E., Bohrson, C.L., Coulter, M.E., Barton, A.R., Kwon, M., Sherman, M.A., Vitzthum, C.M., Luquette, L.J., and Yandava, C.N. (2018). Aging and neurodegeneration are associated with increased mutations in single human neurons. Science. 359, 555-559. Löscher, W. (2011). Critical review of current animal models of seizures and epilepsy used in the discovery and development of new antiepileptic drugs. Seizure. 20, 359-368. Loscher, W., Klitgaard, H., Twyman, R.E., and Schmidt, D. (2013). New avenues for anti-epileptic drug discovery and development. Nat Rev Drug Discov. 12, 757-776. McConnell, M.J., Moran, J.V., Abyzov, A., Akbarian, S., Bae, T., Cortes-Ciriano, I., Erwin, J.A., Fasching, L., Flasch, D.A., and Freed, D. (2017). Intersection of diverse neuronal genomes and neuropsychiatric disease: The Brain Somatic Mosaicism Network. Science. 356. Mirzaa, G.M., Campbell, C.D., Solovieff, N., Goold, C., Jansen, L.A., Menon, S., Timms, A.E., Conti, V., Biag, J.D., and Adams, C. (2016). Association of MTOR mutations with developmental brain disorders, including megalencephaly, focal cortical dysplasia, and pigmentary mosaicism. JAMA Neurol. 73, 836-845. Moller, R.S., Weckhuysen, S., Chipaux, M., Marsan, E., Taly, V., Bebin, E.M., Hiatt, S.M., Prokop, J.W., Bowling, K.M., and Mei, D. (2016). Germline and somatic mutations in the MTOR gene in focal cortical dysplasia and epilepsy. Neurol Genet. 2, e118. Myers, C.T., and Mefford, H.C. (2015). Advancing epilepsy genetics in the genomic era. Genome Med. 7, 91. Nakashima, M., Miyajima, M., Sugano, H., Iimura, Y., Kato, M., Tsurusaki, Y., Miyake, N., Saitsu, H., Arai, H., and Matsumoto, N. (2014). The somatic GNAQ mutation c.548G>A (p.R183Q) is consistently found in Sturge-Weber syndrome. J Hum Genet. 59, 691-693. Nakashima, M., Saitsu, H., Takei, N., Tohyama, J., Kato, M., Kitaura, H., Shiina, M., Shirozu, H., Masuda, H., and Watanabe, K. (2015). Somatic Mutations in the MTOR gene cause focal cortical dysplasia type IIb. Ann Neurol. 78, 375-386. Nikolaev, S.I., Vetiska, S., Bonilla, X., Boudreau, E., Jauhiainen, S., Rezai Jahromi, B., Khyzha, N., DiStefano, P.V., Suutarinen, S., and Kiehl, T.R. (2018). Somatic activating KRAS mutations in arteriovenous malformations of the brain. N Engl J Med. 378, 250-261. Perry, M.S., and Duchowny, M. (2013). Surgical versus medical treatment for refractory epilepsy: outcomes beyond seizure control. Epilepsia. 54, 2060-2070. Pinault, D. (2003). Cellular interactions in the rat somatosensory thalamocortical system during normal and epileptic 5–9 Hz oscillations. J Physiol. 552, 881-905. Poduri, A., Evrony, G.D., Cai, X., Elhosary, P.C., Beroukhim, R., Lehtinen, M.K., Hills, L.B., Heinzen, E.L., Hill, A., and Hill, R.S. (2012). Somatic activation of AKT3 causes hemispheric developmental brain malformations. Neuron. 74, 41-48. Quail, M.A., Smith, M., Coupland, P., Otto, T.D., Harris, S.R., Connor, T.R., Bertoni, A., Swerdlow, H.P., and Gu, Y. (2012). A tale of three next generation sequencing platforms: comparison of Ion Torrent, Pacific Biosciences and Illumina MiSeq sequencers. BMC Genomics. 13, 341. Ribierre, T., Deleuze, C., Bacq, A., Baldassari, S., Marsan, E., Chipaux, M., Muraca, G., Roussel, D., Navarro, V., and Leguern, E. (2018). Second-hit mosaic mutation in mTORC1 repressor DEPDC5 causes focal cortical dysplasia-associated epilepsy. J Clin Invest. 128, 2452-2458. Roth, B.L. (2016). DREADDs for Neuroscientists. Neuron. 89, 683-694. Schindler, G., Capper, D., Meyer, J., Janzarik, W., Omran, H., Herold-Mende, C., Schmieder, K., Wesseling, P., Mawrin, C., and Hasselblatt, M. (2011). Analysis of BRAF V600E mutation in 1,320 nervous system tumors reveals high mutation frequencies in pleomorphic xanthoastrocytoma, ganglioglioma and extra-cerebellar pilocytic astrocytoma. Acta Neuropathol. 121, 397-405. Schirmer, M., Ijaz, U.Z., D’Amore, R., Hall, N., Sloan, W.T., and Quince, C. (2015). Insight into biases and sequencing errors for amplicon sequencing with the Illumina MiSeq platform. Nucleic Acids Res. 43, e37. Shinmyo, Y., and Kawasaki, H. (2017). CRISPR/Cas9-Mediated Gene Knockout in the Mouse Brain Using In Utero Electroporation. Curr Protoc Neurosci. 79, 3.32.1-3.32.11. Shirley, M.D., Tang, H., Gallione, C.J., Baugher, J.D., Frelin, L.P., Cohen, B., North, P.E., Marchuk, D.A., Comi, A.M., and Pevsner, J. (2013). Sturge-Weber syndrome and port-wine stains caused by somatic mutation in GNAQ. N Engl J Med. 368, 1971-1979. Singh, A., and Trevick, S. (2016). The Epidemiology of Global Epilepsy. Neurol Clin. 34, 837-847. Stead, L.F., Sutton, K.M., Taylor, G.R., Quirke, P., and Rabbitts, P. (2013). Accurately identifying low-allelic fraction variants in single samples with next-generation sequencing: applications in tumor subclone resolution. Hum Mutat. 34, 1432-1438. Tezer, F.I., Akalan, N., Oguz, K.K., Karabulut, E., Dericioglu, N., Ciger, A., and Saygi, S. (2008). Predictive factors for postoperative outcome in temporal lobe epilepsy according to two different classifications. Seizure. 17, 549-560. Tian, G.F., Azmi, H., Takano, T., Xu, Q., Peng, W., Lin, J., Oberheim, N., Lou, N., Wang, X., and Zielke, H.R. (2005). An astrocytic basis of epilepsy. Nat Med. 11, 973-981. Winawer, M.R., Griffin, N.G., Samanamud, J., Baugh, E.H., Rathakrishnan, D., Ramalingam, S., Zagzag, D., Schevon, C.A., Dugan, P., and Hegde, M. (2018). Somatic SLC35A2 variants in the brain are associated with intractable neocortical epilepsy. Ann Neurol. 83, 1133-1146. Xu, H., DiCarlo, J., Satya, R.V., Peng, Q., and Wang, Y. (2014). Comparison of somatic mutation calling methods in amplicon and whole exome sequence data. BMC Genomics. 15, 244. Xu, J., Pham, C.G., Albanese, S.K., Dong, Y., Oyama, T., Lee, C.H., Rodrik-Outmezguine, V., Yao, J., Han, S., and Chen, D. (2016). Mechanistically distinct cancer-associated mTOR activation clusters predict sensitivity to rapamycin. J Clin Invest. 126, 3526-3540.